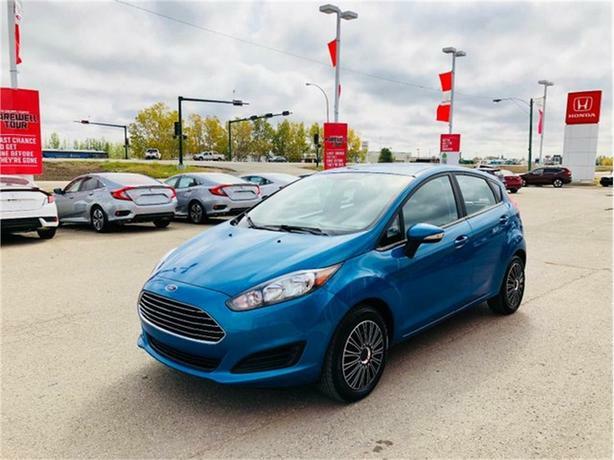 Compact and fuel efficient, this 2015 Ford Fiesta SE is the perfect commuter. The "Blue Flame" exterior is in excellent shape paired with a black cloth interior. The 1.6L engine is peppy and very fuel-efficient respecting your hard-earned money. This Fiesta has been regularly serviced and maintained. For your peace of mind, our certified technicians performed an extensive multi-point, comprehensive used vehicle inspection on this vehicle. other than an oil & filter change, new sway bar links and new front brake pads, nothing more was needed to ensure this quality FWD is in optimal driving condition and more than ready for its next proud owners! This Fiesta comes with a plethora of practical standard features, the SE adds, automatic headlamps, exterior mirrors with integrated turn signals, keyless entry with MyKey, upgraded cloth upholstery, alarm, ambient interior lighting, 12-volt rear power outlet, chrome interior door handles, console armrest, leather-wrapped steering wheel, trip computer with message centre, overhead console, power windows with one-touch driver's side, rear dome light.